Our straight copper ferrules are corrosion-resistant and usually combined with stainless steel wire rope to create a resilient, reliable termination point. They are common across a range of lifting applications and can be made to order, with our custom manufacturing processes giving you total control over the end result. What are Straight Copper Ferrules? Copper is an excellent alternative to stainless or aluminium straight ferrules when a stainless steel rope is used. A copper straight ferrule will keep the rope in perfect condition for longer, while still delivering the strength required to handle heavy loads safely. Ferrules are needed to finish off a wire rope assembly, particularly if you want to create an anchor point using an eye. We produce copper straight ferrules to whatever specifications you need, accommodating wire rope of different diameters and designs effectively. Our contemporary manufacturing techniques ensure exceptional levels of resilient and quality, whether you need a few ferrules or a whole heap. 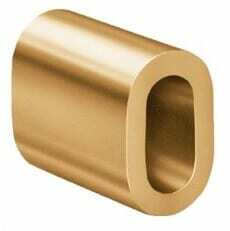 If copper is not ideal for your intended application, then you can find plenty of other materials on our main ferrules page. This includes everything from aluminium and stainless steel to extra-durable carbon steel ferrules. We also produce round ferrules and Syncrimp ferrules for more specialised usage. Call or email the Rope Services Direct team if you have questions about our products, from copper straight ferrules to complete assemblies. The number to call for a phone conversation is 01384 78004, while the contact form will let you email us from your browser. Ferrule Size Fill Factor (f=0.40-0.50) Fibre core Fill Factor (f=0.50-0.60) Steel core Dies Marked Diameter after pressing Straight length after pressing approx. Required pressure approx. Straight Copper Ferrules Overall rating: 5 out of 5 based on 6 reviews.